About 520 years ago, Lake Hamana was opened up to the ocean by the Great Meiou period earthquake and tsunami, creating a dynamic aquatic system wherein water levels vary by 1.2m and over 40,000,000 tons of sea water shift between high and low tide. This system is further fed by Miyakoda river among other sources which carry minerals from the mountains to nourish plankton, which in turn feed marine life. The superb water quality boasted by Lake Hamana makes the perfect habitat for over 800 species of marine life（※）including 473 types of fish, 139 types of shellfish, 101 types of crab, 57 types of shrimp and 14 types of squid and octopus. Lake Hamana houses the elusive Mangrove crab, known colloquially as the “phantom crab” in its northern reaches and is one of Japan’s leading clam habitats by density. In the summer months, one can see throngs of people descend upon low tide to go clamming. The warm climate and abundance of marine life are an absolute paradise for birds. Usually spotted in summer, the little tern knows that even a winter stopover at Lake Hamana can provide a tasty snack or ideal nesting ground. Water and sky aside, look to the shore of the lake and find bindweed and Japanese sedge in abundance. The area is teeming with all varieties of life both on and off shore, which is why Shizuoka prefecture has designated it a prefectural natural park. In addition, Lake Hamana has been selected by the Ramsar Convention as a candidate for Wetlands of International Importance. At a relatively shallow 1〜2ｍ, the southern half of Lake Hamana has wide-reaching tidal flats and sandy beaches. Here in the crystal clear waters you can find clusters of eel grass, known as amamo, which is a type of seaweed about 20cm〜100cm in length. Eelgrass beds are spread throughout the area and look white as cotton when they begin to bloom in June. Beyond its unique look, eelgrass serves an important purpose in fighting oxygen depletion in the water through photosynthesis. Once an integral part of fishing areas, eelgrass beds have greatly fallen in number in recent years due to water contamination caused by land reclamation and levee construction. Currently, the largest home of eelgrass beds sits protected in Lake Hamana, right next to Hamamatsu city and its population of 800,000 people. 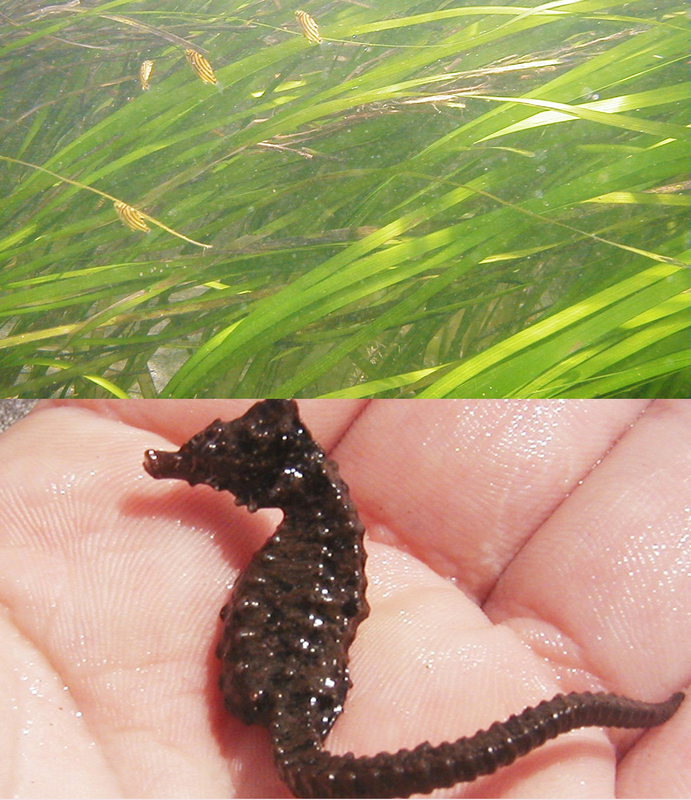 Eelgrass leaves grow long and wide, which maintains a gentle current and keeps out larger fish. This creates perfect conditions to lay eggs and raise young, which is why eelgrass beds are known as “cradles of the sea.” The water around eelgrass beds is also full of life: skeleton shrimp swim above, seahorses, pipefish play amongst the leaves, and pipefish join goby, swimming crabs, lake prawn, hermit crabs, sea urchin and more along the lake bottom. This also serves as quite the buffet for hungry predators. 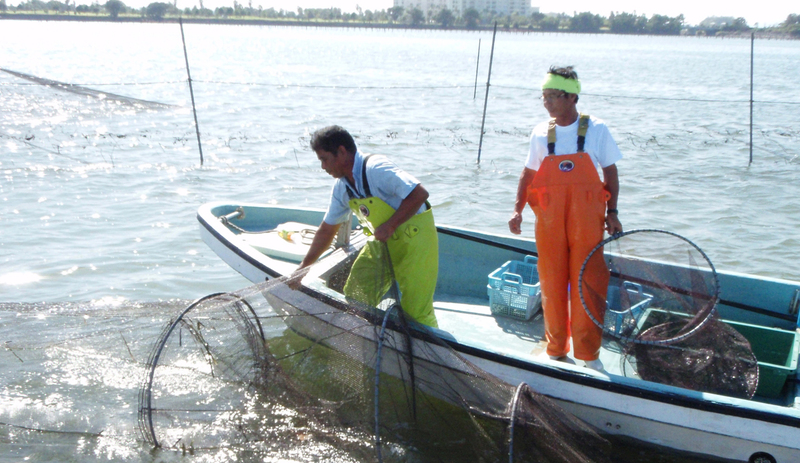 In late autumn and winter, eelgrass beds begin to wither and shrink in number just as cultivation of seaweed and oysters in Lake Hamana gets going. The seaweed depends on nitrogen and phosphorus to grow strong, while oysters gobble up their fill of plankton and other organic matter. This process purifies the water, providing an ideal environment for eelgrass, which in turn keeps the lake oxygen-rich for the next harvesting season. Eelgrass beds have helped support a clean and pure Lake Hamana since Japan’s oldest seaweed husbandry opened there in the Edo period, through the rise of oyster harvesting beginning the 20th year of the Meiji period, and remain an integral part of the many fisheries operating on its shores today. Lake Hamana holds countless educational opportunities. 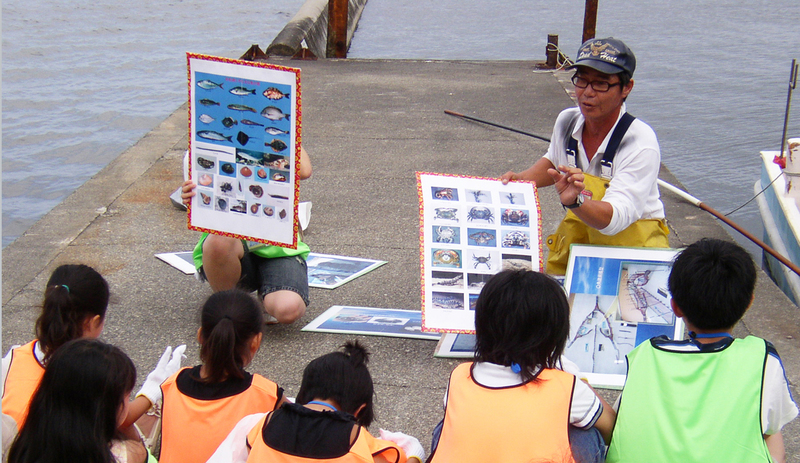 The Tōkai University Marine Science department does research on fish and benthos (seabed organisms) while elementary schools near the shore conduct studies of the lake’s environment. 6th-year students at Shōnai Elementary take part in an Education for Sustainable Development (ESD) program, working over the course of a year with local fisheries, farmers and tourist companies to learn about the history and culture of Lake Hamana including the numerous creatures that call it home. What students once thought was just an empty body of water becomes vibrant and abundant with life right before their eyes, and students realize just how much they took this nearby lake for granted, quickly becoming a new generation of champions for the charm and value of Lake Hamana.